The history of Altaville is closely identified with that of Angels Camp. 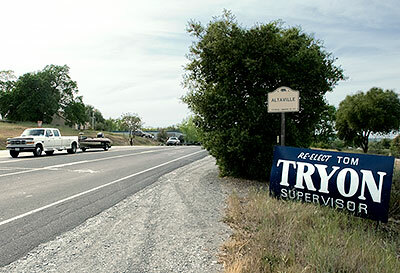 Altaville has been the foundry town of Calaveras County since D. D. Demerest established a foundry there in 1854. Most of the stamp mills and a large part of the mining machinery erected in Calaveras and Tuolumne Counties were built at the Altaville Foundry. A brick schoolhouse was built at Altaville in 1858 and the townsite was established in 1873. We found a Caltrans highway marker for Altaville, but we were unable to locate a commemorative plaque.